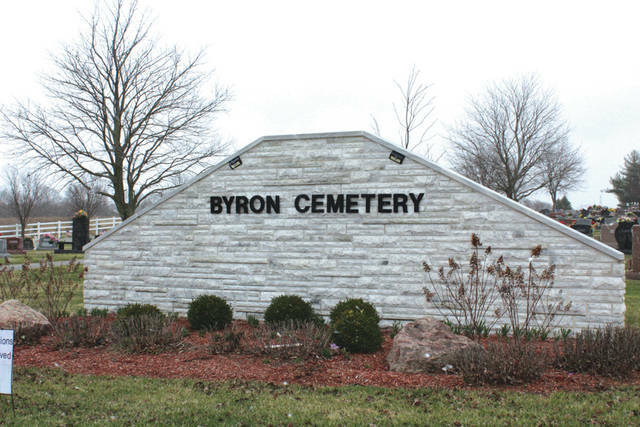 Linda Collins | Greene County News The annual spring cleanup of Byron Cemetery is underway officials are taking the necessary measures to have the cemetery grounds ready for the Easter holiday. BATH TOWNSHIP – The annual spring cleanup of Byron Cemetery is underway, and Bath Township officials are taking the necessary measures to have the cemetery grounds in pristine condition by the Easter holiday. According to Township Cemetery Supervisor Teresa Phillips, the cemetery will take on a new fresh look as the cemetery staff clears leaves, tree branches and remaining debris from the cemetery grounds, as well as remove and dispose of all fall and winter decorations that currently remain around the foundations of in-ground graves. This includes all holiday wreaths, grave blankets, artificial flowers, trinkets and potted plants. Other cleanup tasks will also include trimming trees, pruning shrubs and bushes, and cleaning around headstones and buildings. During the mowing season, decorations placed on or near gravesites for public holidays will be permitted to remain at the sites for five days following each holiday. Cemetery personnel will then remove any decorations left after that time and dispose of them. Shepherds hooks and eternal flames will not be allowed in the cemetery unless they are installed in the concrete foundations at the in-ground gravesites. Township officials are also making a concerted effort to raise more awareness about the benefits available to military veterans who are buried in the township cemetery. Phillips said deceased veterans are eligible to receive gravesite markers and medallions from the U.S. Department of Veterans Affairs (VA) for only a nominal fee for installation. Rules specific to Byron Cemetery regulate how the commemorative markers may be placed at the gravesites. Flat markers in granite, marble, and bronze and upright headstones in granite and marble are available to eligible veterans. However, the government does not furnish a base. The VA also provides a medallion to be affixed to an existing, privately purchased headstone or marker to signify the deceased’s status as a veteran. Each medallion is inscribed with the word “veteran” across the top and the branch of service at the bottom. Phillips noted that the Fairborn Veterans of Foreign War (VFW) Post 6861 places a flag in every flag holder at the cemetery the week before the Memorial Day holiday. The local VFW post also holds a special memorial service at the cemetery at 9 a.m. on Memorial Day each year. The members of the VFW post then return a week later to collect all the flags that were placed on veterans’ graves. During a recent township meeting, Township Trustee Steve Ross praised Phillips and her staff for their superb maintenance and care of Byron Cemetery. He also pointed out that the cemetery, which is located at 3256 Trebein Rd. in Fairborn, attracts a number of visitors each year who walk among the well-manicured gravesites and throughout the cemetery grounds. “It is one of the most well-groomed cemeteries in the state because our cemetery staff takes great pride in maintaining and preserving this cemetery for our residents,” Ross said. For more information regarding veteran headstones and markers, please visit the U.S. Department of Veterans Affairs website at va.gov or contact the cemetery office at 937-878-9700.
https://www.fairborndailyherald.com/wp-content/uploads/sites/50/2018/03/web1_Byron.jpgLinda Collins | Greene County News The annual spring cleanup of Byron Cemetery is underway officials are taking the necessary measures to have the cemetery grounds ready for the Easter holiday.